The Most Honed and Capable Aquabot Ever. It is the kind of arrival that announces itself. The all-new Aquabot Elite comes into the world not so much unveiled as unleashed. 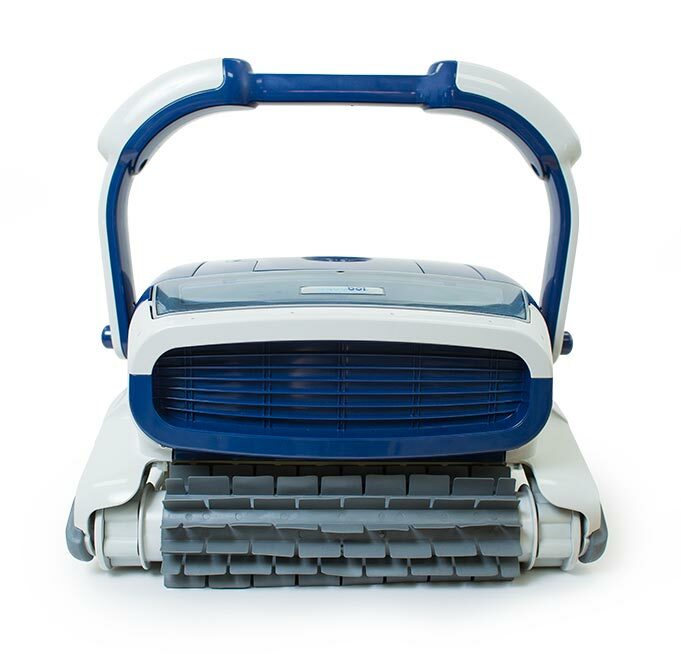 A sleek, powerful presence of sophisticated design and performance that makes it clear that this is an unmistakable, undisguised leap forward for robotic pool cleaners. The Elite is all-new. Building on the success of the most award-winning Aquabot robot ever. Possessing an unrivaled combination of performance and efficiency. All enhanced by state-of-the-art technologies that keep Elite performing on a whole new level. Aquabot engineers developed the Elite through years of research followed by real-world testing by thousands of pool owners over three continents. It’s proven and ready to provide an experience so gratifying, you’ll wonder how pools were ever cleaned before. Meet the All-New Aquabot Elite. The design philosophy of Aquabot is demanding in every respect. Every smallest detail is questioned until an absolutely unique overall product emerges. The new Aquabot Elite not only meets this challenge, it actually defines a new milestone in our history. The Elite is a collection of innovations designed to deliver a premium and worry-free pool robot experience. To help our customers take control of their pool, we were driven to use innovative technologies in a visionary way. And we hope that others see that by crafting a bolder path now, we are set to challenge expectations long into the future. The Elite Adds by Subtraction. When it comes to robotic pool cleaner technologies, the Elite starts where others leave off. In the most recent iteration of the Aquabot, Adaptive Surface Traction imbues the Elite with confidence-boosting grip on nearly any surface for optimal tracking, regardless of the slope. Two powerful yet energy-efficient motors give you the best of both worlds. And whatever you may find in your pool, Elite has everything you need to handle it – thanks the JetForce™ technology and the enhanced storage capacity of dual high-capacity filter cartridges. Discover the true capabilities of a microprocessor-controlled, track driven pool robot – as only the Aquabot Elite can deliver. Progress. It’s behind everything we do at Aqua Products. It’s why we’re always developing new technologies to revolutionize automated pool cleaning. The engineers created new motors and drive systems that deliver improved performance and higher energy efficiency. State-of-the-art DC motors and an ingenious ergonomic design deliver an exceptional user experience while reducing energy use up to 90%. The all-new Aqubot Elite is the very latest step on our journey of progress. It’s one that brilliantly reflects the engineering expertise that has gone into its development. And it's easy to see why the new Aquabot Elite is the answer to the changing demands of pool owners everywhere. You’ll be glad to know the robot of the future has no messy, difficult to clean bags. Not only did engineers give the Elite dual high-capacity filter cartridges, they completely changed how they’re accessed. Removal of the cartridges is now faster and easier than ever before. One glance through the ClearView panels lets you know if the cartridges are full. The Elite is the first robot that gives you the option to remove the cartridges without removing the cleaner from the pool. The quick-release cartridges can be removed with one hand in about a second. The large access door swings open to make debris removal as easy turning the filter upside down or spraying with water. Removing the cartridge and putting it back is tidy and quick, so the Elite can get back to business in no time. The ergonomic design of the new Elite means that handling your robot is easier than ever before. The engineers believe that working smart, not hard, begins with the ergonomic design of the robot. Industrial designers were tasked with creating a functional, comfortable and easy to use robot. The goals were reduced physical stress, reduced time to clean, and more time to enjoy the pool. Handling your robot should be as productive and as effortless as possible. When you have to lift a heavy robot from the water, turn it upside down and remove cumbersome bags or cartridges, pool ownership is still a chore. The Elite engineers understand that part of technological innovation is designing a robot that adjusts the job to you. That’s why Elite is the first robot with cartridges that can be removed without lifting the robot from the pool. If you prefer to move Elite to the deck, Elite is now 30% lighter than traditional pool robots. The quick-release cartridges can be removed with one hand in just one second, making removal of the cartridges faster and easier than ever before. Designed to relieve stress on your body, the ErgoGrip handle is a convenient place to lift. The new Featherlight™ cable also embraces the new way of thinking and is 40% lighter than traditional robot cables. Whatever you may find in your pool, Elite has everything you need to handle it – thanks to JetForce technology. You’ll notice right away that Elite has a wider vacuum path of 10 inches. The size and depth of the intake ports were also increased and now sport a size of one inch wide by about 10 inches long. The 25% wider ports enable Elite to handle even the largest debris. The unique radius shape of the JetForce cartridge creates a venturi effect, separating dirt and debris from water. This allows the Elite to maintain high suction, even when both cartridges are loaded with debris. Due to the pressure difference in the top and bottom of the V-shaped cartridge, debris is forced downward to the bottom of the cartridge and away from the path of exiting water. Adjustable suction ports enable you to fine tune the suction port size and water velocity to suit the task at hand. Experience a powerful clean and no loss of suction with JetForce technology. There are few pool cleaners that are capable of cleaning your pool in a truly satisfying way. It started with a vision. A vision to completely reimagine what we expect from a robotic pool cleaner. Traditional cleaners have no brushes that contact the pool surface. We gave Elite not one, not two, but three powerful brushes. Engineers gave Elite Two spinning brushes that power scrub the pool surface and a third center CleanSweep™ brush that rapidly oscillates back and forth to dislodge stubborn contaminants. Together, the triple brush systems provides exceptional agitation and brushing performance. In addition to vacuuming loose debris, the new Elite really shines when it comes to difficult to remove contaminants like algae, bacteria, and biofilm that’s firmly attached to the wall of most pools. There are 21,000 known varieties of algae. Chances are, you’ve dealt with at least a few of them. Resistant to chlorine, biofilm is self-perpetuating and very difficult to remove. Traditional pool cleaners only pick up loose contaminants, leaving stubborn contaminants stuck to the pool wall. But the Elite attacks stubborn contaminants at their core. Biofilms in swimming pools can and often do lead to cloudy water, algae blooms, scale build-up, and even corrosion. Traditional pool sanitation focuses on treating symptoms rather than the root cause of the cloudy water, algae, or slimy surface. When Elite is in charge of cleaning your pool, it doesn’t just vacuum. It uses three powerful brushes to scrub every square inch of the pool surface, including the wall, coves, and waterline for a more thorough clean than ever before. The new generation Aquabot stakes a claim as the flagship robot by starting with a thorough understanding of the needs of pool owners. Every part of the new Elite is designed to give you superior performance and the cable is no exception. Pool cleaners turn over 300 times per day in a typical swimming pool. All that turning leads to frustration as ordinary cables twist and tangle. For the first time ever, we introduce the newly developed 360 degree anti-tangle swivel. Twisted and tangled cables destroy pool cleaner performance and efficiency. The Elite swivel spins 360 degrees, so no matter how many times the cleaner spins and turns, your swivel is there to keep things straight. The swivel allows the Elite to perform as designed, day after day. After all, a robot can’t do the job it was designed for if it’s hindered by a tangled cable. Engineered to be maintenance-free, the anti-tangle swivel is a revolutionary feature that requires little and gives a lot. On paper, the underwater robotic cable swivel is simply one of the greatest engineering accomplishments in our field. In the real world, the swivel transforms your robot into a workhorse that can clean, scrub and operate day after day without human intervention. When it comes to wet grip traction and applying power, the Elite starts where others leave off. The layer of water in the contact patch makes it difficult for wheels to grip the pool surface. Slippage results in lost energy efficiency and reduced performance. The Elite takes a radical departure from the conventional wheel with continuous rubber tracks. The large surface area of the tracks distributes weight better than wheels, enabling a continuous tracked robot to traverse almost any pool surface, regardless of how slippery it may be. The much greater surface area of a rubber track improves directional control and delivers more force than wheels. Wheel slippage is eliminated. Energy is conserved. Tracked robots also smooth out bumps and easily glide over obstacles like main drains and are even capable of climbing straight up a vertical wall. The Elite’s immense grip is further enhanced by the special soft and pliable rubber compound within the tread. Engineers created a special water-optimized tread and geometric shape to improve wet performance while minimizing the rolling resistance. The result is best in class traction, agility and climbing performance. Everyone wants to do more with less. That’s why Elite uses a range of technologies to reduce energy consumption. Electricity is the energy of the robotic pool cleaner future. No longer is it necessary to power a pool cleaner from your main pump or booster pump. That requires up to 1800 watts of energy and is far too inefficient. There’s a new mandate that guides the engineering principles of AquaBot. Conserving resources while maximizing output. That’s why the Elite’s dual 24 volt motors operate on nearly 90% less power than AC booster pumps. Running on just 180 watts, the 3000 RPM motors sport an hourly cost to operate of just 5 cents per hour. The Elite is engineered to thoroughly clean quickly and thoroughly. This means you can schedule it to run less often. The Elite is built with programmable start/stop. The system shuts down Elite after its cleaning cycle and restarts it again only when needed. The new system saves even more energy because you’re only running Elite when needed, not every single day. Adaptive Surface Traction (AST) helps get the most out of every ounce of power. Sophisticated algorithms are designed to react intelligently to pool conditions for improved traction. Slipping robots use up to 200% more energy. Better traction inevitably leads to greater efficiency. AST helps prevent you from losing traction instead of working to regain it. Adaptive Surface Technology provides more grip over slippery walls, loose surfaces, undulating surfaces and while climbing the wall. Elite constantly monitors the environment and makes microprocessor controlled adjustments to maximize cleaning efficiency. Conserving Resources while maximizing output. The patented AquaSmart system has always meant Aquabot was way ahead. The newest release means that Elite is more capable than ever. Some pool cleaners just wonder aimlessly around the pool. The AquaSmart 2.0 microprocessor control system relies on next-generation hardware and software connected to sophisticated directional controls. The chaos is over. The new measured and systematic approach eliminates wasted energy, minimizes overlapping cleaner paths, and reduces general wear and tear. For the first time ever, the pool robot literally maps the pool size and shape. This learned behavior dramatically improves the ability to clean any pool thoroughly and efficiently, regardless of size, shape or design. The new obstacle avoidance programming logic includes a pull-away feature that prevents Elite from getting caught up on pool features such as stairs and ladders. It’s time to forget everything you once thought about robotic pool cleaners and imagine a new world of efficiency and performance. This is the world of Aquabot Elite. It’s smart to embrace light thinking. There is a school of thought that a pool cleaner must be big and boxy, as if its performance could only come from considerable mass. Thankfully, our engineers did not attend that school. The new Elite takes a more enlightened approach with a belief that form must follow the demands of function. The new lighter and even more powerful Aquabot has arrived. As engineers, we don’t add more of something when less will be more effective. That’s why we designed the Elite to be lean. The result is high power per pound. In robotic pool cleaners, weight is the enemy of efficiency and performance. In our engineers’ quest to make the Elite as light as possible, we looked to nature for inspiration and discovered the fascinating design of bamboo. Lightweight yet strong, bamboo is a great example of natural efficiency. Taking cues, our design adds strength where needed and removes weight where it’s not needed. Putting control in the hands of the pool owner has been a signature of Aquabot from the start – and with the Elite, the tradition continues. The guiding engineering principle behind the Elite mandates conserving resources by maximizing output. The new Elite gives you the power of choice – and control, to satisfy all pool owners. Now you can program both the number of hours Elite operates each day and how frequently Elite cleans. Engineers included built-in custom cleaning modes with durations of 1 hour, 1.5 hours or 2 hours. The cleaning frequency can be set to every 2, 3 or 4 days. Although Elite has its own timer built-in, it’s also fully compatible with your own digital timer or automation system, giving you ultimate flexibility and control of cleaning schedules. There are few pool cleaners that are capable of cleaning your pool in a truly satisfying way. That’s because there are few pool cleaners that can deliver on all counts – from algae on the wall to leaves in the deep end, to ultra-fine debris. The Aquabot Elite is an exuberant take on Aquabot’s original robotic pool cleaner. Elite plots a new course for modern-day pool cleaning. It starts with a rugged and powerful track driven design, that’s also graceful and agile in the water. It’s not enough to merely read about the Elite. This is a robot that must be dropped into a pool to be truly appreciated. There’s no better way to get to know the new Elite than by trying it in your own pool. Your Elite dealer offers a 30 day in-pool guarantee. Try Elite for 30 days and if you’re not 100% satisfied, you’re invited to return it.